For many people in America, Christmas Eve is just the day before Christmas. But for my family it was the BIG holiday. 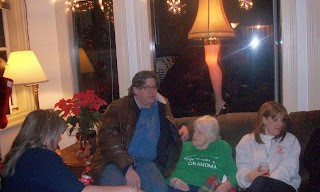 Our Grams was a waitress who worked Christmas Day, so our family (on my moms’ side) always got together Christmas Eve. Have I ever mentioned that my mom is one of nine children and I am one of 18 grandchildren? And yes, we all fit into a small house. Well, most of the time. Christmas Eve was even more special to my immediate family as it was my father’s birthday. So every year we gathered, had turkey, birthday cake, ham, ambrosia, green salads, pie, fattigman, julekaka, and so much more food! Since I was about 5 years old my aunts would put me to work, usually after the boys wouldn't let me play with them. The kitchen was tiny so I was put in the breakfast nook with a peeler and bag of potatoes. Ah, it still brings back fond memories. Growing up Christmas Eve was never about the gifts. We got them yes. Oranges from one uncle, cordial cherries from another, gifts from Grams and other cousins, and of course, my dad would get birthday presents. At home that night, if we were really good, we got to open one present! Everything changed when Grams had a stroke. We had just moved north to Snohomish to live in the 'country' with our horses, and it was decided that since we had the land Grams could put a mobile on our new property. Christmas Eve didn't change much. Family came, grew with new great grandchildren, I played Santa with Aunty H, we got Beer from one uncle, but the cordial cherries stopped, grams gave us all underwear one year, and then for some reason (I think it was due to my dad wanting to have his Birthday Dinner separate and we now lived with grandma and didn't want two huge meals on two days), we stopped doing the huge meals on Christmas Eve. Someone came up with the idea of buying the big Stouffer's lasagnas. Ever since it's been our Christmas Eve Tradition. But times change, and so did we. Cousins stayed home with new babies, moved away. Almost 15 years later my parents divorced, Grams was forgetting things and after she broke a hip had to be moved to a rehab home. Given that we couldn't bring her back the her house, we started doing Christmas in Seattle at uncle J's house. As my parents were divorced and not on friendly terms I had to split up my holidays. It was really tough, especially since I was juggling birthdays and Christmas! As this is my story and my memories, I’m going to skip over some really rough years and get to the better ones. In 2008 it snowed. I did thanksgiving half with Dad, half with Mom's side. Christmas Eve was spent in Seattle, and then went to moms with Missy Kitty. Christmas Day I went to Dad’s and had a great day with him. So it was a win win! I had my own apartment and I was super happy. But in May of 2009 my world stopped as my dad was diagnosed with Lung Cancer, stage 4, which is the terminal one. Daddy passed away that September, leaving a big hole in my heart. My father was not a perfect person. He had his faults and made his share of mistakes in his life. But he loved my sister and me. There has never been any doubt in my mind that he loved me to pieces and those are the memories that I cherish. Christmas of 2009 was my first attempt at a Christmas Lasagna. Well, I had made one for myself one time before, but the first time I wanted anyone else to try my food! 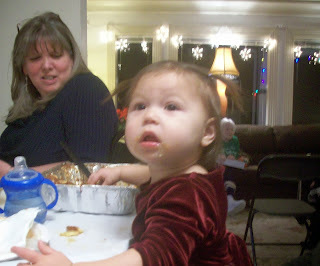 You can tell from the picture of little 2nd cousin C and my mom that it was GOOD! And my grams loved it. She was always encouraging me to follow my dreams and passions. Here’s a picture of her with my uncle, mom, aunt and family friend. She was in the mix of things and enjoying life! Unfortunately this was her last Christmas. Losing two of the most important people in my life changed me. I wanted to follow my dreams and passions... One of them, obviously, is cooking. And not just cooking, but sharing with family and friends. 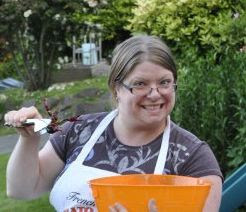 I did a few cooking classes, experimented with lots of ingredients and lived. 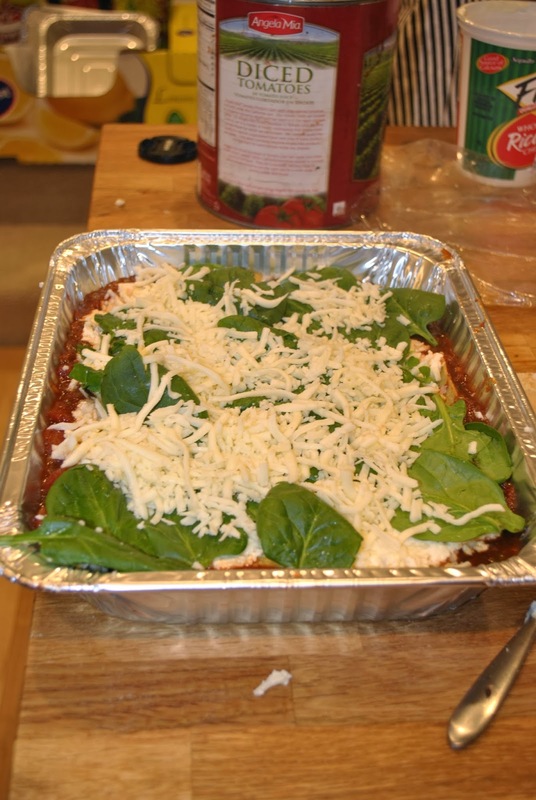 The following year, Christmas 2010 I met up with my cousin’s wife D and together she and I made several homemade lasagnas, with fresh pasta, spinach, game meats, lots of cheese and great red wine marinara sauce! Their townhouse smelt DIVINE! This was also the year that I had met my husband and I brought him along to our Irish-Norwegian Christmas Eve in Seattle. Complete with Lasagna, leg lamp and stories galore! We had a GREAT Christmas, wrapped up in memories of love and laughter with family. Each year since I make lasagna for Christmas Eve Dinner. It's my way of remembering family and friends, and doing something that I love. I'm not posting my recipe. It's something of a work in progress. I change it every year. But it's simple. Tomato-Wine Meat Sauce, Cheese mixture (Ricotta Mozzarella, Parmesan and Egg) and pasta. Layer and bake. It's really that easy. To me, Christmas Eve is about celebrating life with those that you love. As I've had a long road of recovering from Viral Meningitis, we won't have a houseful tonight. There may just be two persons and one cat tonight in attendance, but they’ll be more here with us in spirit as we have Christmas Eve Lasagna and watch a movie in our Pj's. Happy Birthday Daddy. We all miss you.